On April 8 at 8 a.m., The Herb Box will be the first tenant to open its doors at The Colony, a new mixed-used development at Seventh Street and Missouri Avenue in midtown Phoenix. The Herb Box has two existing locations in Scottsdale, one at DC Ranch in the North Valley and another at Southbridge in Old Town. The new location at The Colony will be The Herb Box’s first expansion outside of Scottsdale since the company was founded in 1995. The Herb Box is known for its innovative world cuisine, showcasing fresh, seasonal ingredients, with a menu heavily focused on healthy, veggie-centric dishes. The Herb Box at The Colony will offer the same signature dishes that longtime fans know and love, featuring unexpected twists on tried-and-true cuisine. Popular dishes include the Avocado Love™: whole grain toasts topped with an avocado-lime smear, arugula, fennel, a sweet-hot Serrano glaze, and lemon-honey vinaigrette. A hearty vegetarian dish, the Korean Fried Cauliflower is crisp cauliflower tossed in a Korean hot pepper sauce, served over quinoa with sugar snap peas and pea shoots. Meat lovers will enjoy the Beef Short Rib Enchiladas with manchego and ancho chile sauce or the Chargrilled Kobe Burger topped with bacon, Brie, and apple-jicama-watercress slaw. In addition to lunch and dinner, The Herb Box will offer a full-service breakfast Monday through Friday, as well as an expanded brunch menu Saturday and Sunday. A variety of sweet and savory breakfast dishes will be available, including Simple Good Morning Eggs and Bacon, Bourbon-Ginger Peach French Toast, and Steak and Eggs. For those on the go, The Herb Box will also have a coffee bar and housemade pastries and baked goods that can either be ordered indoors or from an outdoor walk-up window.Beginning April 8, The Herb Box at The Colony will be open Sunday through Thursday from 8 a.m. to 9 p.m. and Friday and Saturday from 8 a.m. to 10 p.m. The Herb Box is located at 5538 N. 7th St., Phoenix, Ariz., 85014. For more information, call 480-393-0432 or visit www.theherbbox.com. Founded in 1995 in Scottsdale, Ariz., The Herb Box began as a catering company inspired by CEO/Owner, Susan Wilcox’s desire to offer high-end catering and exemplary client service. Since then, the company has expanded to include two Arizona restaurant locations, one with an attached quick-service market, and the special event catering business has continued to flourish. 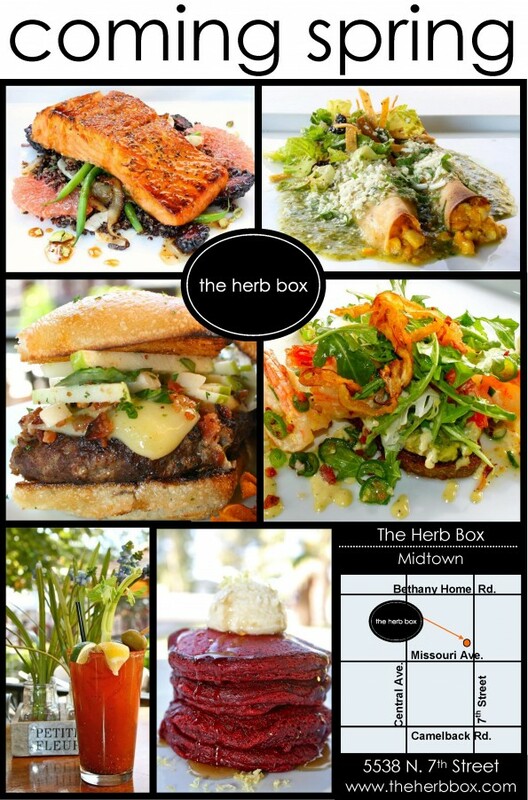 The Herb Box features savory twists on tried-and-true cuisine and fresh, seasonal ingredients that unify regional flavors. The Herb Box has two Scottsdale locations in DC Ranch at Market Street and at Southbridge in Old Town and a third location will open in the spring of 2016 at The Colony in midtown Phoenix. For more information, visit www.theherbbox.com.